In 1869, the ‘Welsh Fasting Girl’ Sarah Jacob was a national sensation. She was also an enigma: a twelve-year-old child who appeared to have survived without food for two years. Sarah was just ten when her fast had begun. An otherwise unremarkable child living in rural Carmarthenshire, she first began to refuse food after a short illness. Some claimed her to be a miracle, a fasting saint; visitors travelled across Britain to bring her money and gifts. But the apparent miracle provoked controversy in the national press, with pilgrims and scoffers battling over the bona fides of this small Welsh child. To settle the case, sceptical doctors placed her under strict observation by a team of nurses. Scientific curiosity was quickly satisfied; under a twenty-four hour watch, Sarah Jacob starved to death within days. Her parents – who had refused to send the nurses away as the girl weakened – were later convicted of manslaughter. It was a tragic and, in many ways, an inexplicable case. But Sarah Jacob was only one of the ‘fasting girls’ who exerted a strange fascination in the Victorian period. 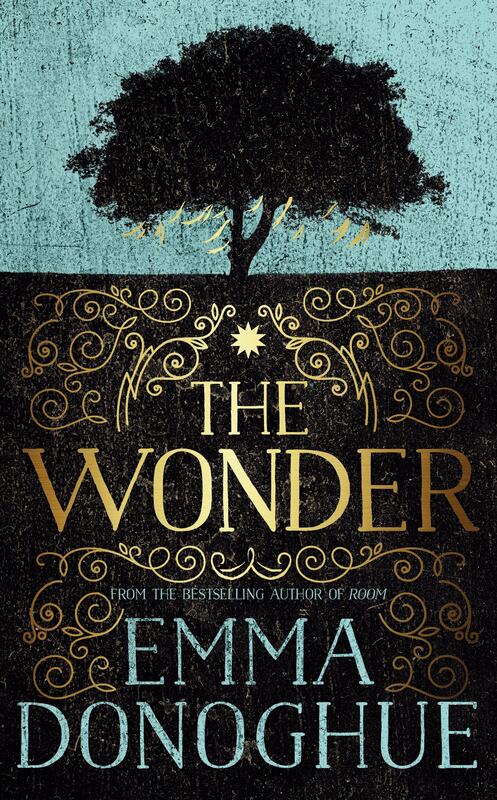 As the most famous of them all, she is surely the inspiration for Emma Donoghue’s latest novel, The Wonder. Like Room, which inspired Donoghue’s Oscar-winning screenplay, this novel again presents a story of a child in captivity – though in this case, the prison may be one of her own making. Anna O’Donnell is eleven years old, a pious and intelligent child who has apparently not eaten in the four months since her Confirmation. The lineaments of her story closely follow that of Sarah Jacob, but Donoghue has transported it to 1850s Ireland, and to a countryside still in recovery from the cataclysm of famine. It is a setting in which self-willed starvation seems all the more inexplicable and for those around her, the mystery of the girl’s survival might be horribly pointed. Why should this child be saved, and not all the others? If it is a religious miracle, it seems a cruelly belated one. But that random stroke of luck, or miracle, accounts for the fascination which these fasting girls exerted across Victorian Britain. In an age when childhood illness often ended in death, the inexplicable survival of girls like Sarah Jacob made them not just objects of curiosity, but also of desire. They were charmed, or blessed; like the ascetic saints of the Middle Ages, they suffered and yet they survived – like modern incarnations of Catherine of Siena, given to punitive and extreme fasting. Yet the fasting girls had their detractors too. These cases channeled superstition more than institutional religion, and in doing so they also challenged the growing authority of science and professional medicine in the late Victorian period. In the culture wars of the time, the fasting girl might have seemed a dangerous relic from an earlier age: a last rallying of folk religion and superstition. And so a child’s sickbed could quickly become a battleground for the competing claims of folk cures and modern medicine, religious miracle and science. In the case of Sarah Jacob, that clash proved fatal. There is no mystery as to the cause of her death in 1869. The real mystery is in the actions of the adults around her. Between the need for a miracle and the desire for proof, somehow a young girl was allowed to die. In 2014, the historian Stephen Wade published an account of the case which explored the mystery in terms of the conflict of religion and science in Victorian Britain, the medical treatment of women and the culture of spectacle. The Wonder takes Sarah Jacob’s story as a frame for quite a different set of concerns. Donoghue’s story is told by an outsider, Lib Wright – an English Nightingale nurse who is engaged by a local committee to investigate Anna O’Donnell’s case. Lib is to watch the child by day and night, sharing her duty with a reticent Catholic nun. The stage is set for a conflict between English rationalism and Irish superstition, the claims of science and those of religion. The character of Lib Wright is rather broadly drawn: a prim woman with a native suspicion of Ireland and its Catholics. Country practices confuse her – she ‘understood nothing about this place’ – but her determination to understand and expose Anna’s fraud gradually turns to concern. The two are pitted in a game of wits against each other, one that is reflected in the riddles Lib poses to Anna and which the intelligent child invariably solves. But Ireland itself remains a riddle to Lib, with its piety and its superstition, its people’s belief in maleficent fairies and beneficent saints: ‘Like babies, the Catholics, babbling as they squeezed their beads.’ Out walking, she follows a road through a bog and finds that, aggravatingly, it leads nowhere. It is another example of Irish fecklessness and carelessness, she suspects, until a local man explains that the road is a legacy of famine relief works, built to occupy the destitute and forestall the need for charity. The road to nowhere is the result of British mismanagement rather than Irish ineptitude. As time goes on, she becomes almost blind to the girl’s deterioration. It is a suggestion, perhaps, of how the O’Donnells are able to live with their daughter’s condition: by becoming almost unaware of it. 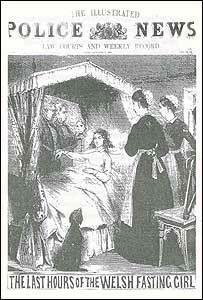 The waking dream in which Anna is caught mirrors the child’s confinement in Room. Like the fasting girl, Jack is unaware of the peril of his situation. What both children need is an adult saviour. The doctor does not mention that it would also put an end to Irish famine. In a reverse to Lib Wright’s expectations, in the battle between science and superstition it is the local priest who serves as sceptic here, though he is unwilling to intervene with the O’Donnell family. Lib must look for support instead from the nun who is sharing her watch, but that woman’s ideas of duty and propriety are far different from her own. Perhaps the most compelling aspect of this novel is its attention to a religious culture that elevates suffering, and yet which provides consolation too. But as Anna’s case unravels, this element of the story is elaborated with lurid revelations, and these present too pat an explanation for the mystery Lib has arrived to investigate. As Lib comes to realise, the question is not how Anna O’Donnell is committing a fraud, but why. In answering that question, a novel which begins as a study of female confinement – both social and psychological – ends unsatisfyingly in high Victorian melodrama. Admittedly, in that much it might take inspiration from the fiction of the period in which it is set. Early on, Lib’s watch brings to mind that ‘awful nurse in Jane Eyre, charged with keeping the lunatic hidden away in the attic.’ Lib is not here to stand guard, she establishes with her employer, but ‘simply to observe’. In Brontë’s novel, the madwoman – the unconventional woman, full of the drives that Jane Eyre represses – finally escapes her prison, only to be destroyed. But in The Wonder, Lib refuses to play her part as jailer. She wants to bring about the salvation that this confined child, Anna, only dreams of. Anna O’Donnell looks to the afterlife for renewal and release. But the challenge for the rational Lib Wright is to enable the young girl’s liberation in this world. This review was first published in The Dublin Review of Books.